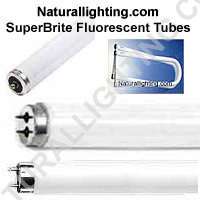 SuperBrite T8, T8 U-Bend, and T10 Fluorescent Tubes. High output and long life. Rated at 30000 hours. Excellent for general lighting in retail stores, hospitals, parking garages, shopping centers, office buildings, and other general lighting requirements. Contact Naturallighting.com for more information.